Publishing content to Pugpig is a 2-step procedure. Once the changes has been sent to either the dev app or to production in Canvasflow, it is necessary to update the appropriate content source from within the Pugpig Distribution service. It is this final step that will result in your content changes being displayed in your app or web viewer. Login to the Pugpig distribution service. Access the required Pugpig publication. From the 'services' menu on the left pane, expand the Content Sources menu and select the source you wish to update. Typically this will be either ‘live’ or ‘dev’. Once the correct content source is selected, click the 'Update 'Content' button which will start update. 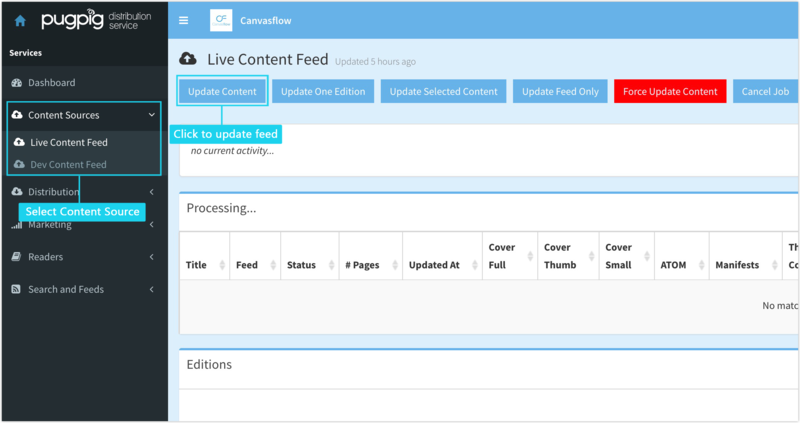 Pugpig will now scrape the content from the Canvasflow servers and update the publication accordingly. Once the update has finished, you will be able to view the changes to the issue from either the appropriate app and / or web viewer (accessed at the bottom of the Services panel). Updating a content source which consists of a large number of issues (or content changes) can take sometimes take a while, particularly if the Pugpig distribution service is under load.